The near double-digit move came despite weak natural gas prices and the fact that Chesapeake Energy Corp. didn’t report any needle-moving news. 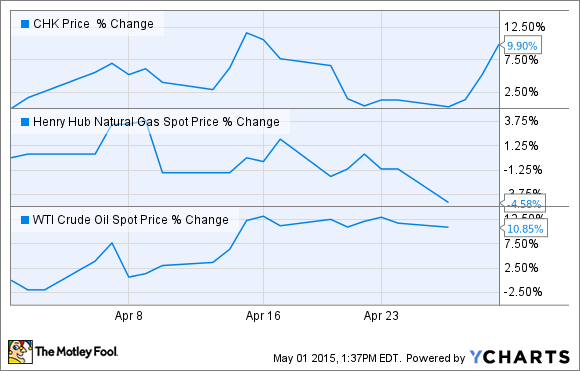 What: Chesapeake Energy's (NYSE:CHK) stock surprisingly surged just about 10% in April. I say surprisingly because natural gas prices weren't all that strong and the company didn't report any news relating to its current operations. Instead, the share-price spike grew out of stronger oil prices and some legal settlements. So what: While less than 20% of the company's production is oil, that commodity carries a much higher margin than gas despite the recent weakness in its price. So rising petroleum prices offer a nice boost for the stock. Chesapeake Energy last month also announced that it settled two legacy legal issues. In the first settlement, the company received $25 million and 6,000 net acres in the Utica shale from the financiers of former-CEO Aubrey McClendon's new company after he allegedly stole trade secrets to start the business. Separately, Chesapeake paid $25 million to settle antitrust and racketeering charges with the state of Michigan regarding its alleged collusion with Encana (NYSE:ECA) to bring down lease prices for drilling rights in the state. Now what: Higher oil prices and putting its past in the past are certainly helping make Chesapeake investors a little less apprehensive about the company's future. That said, the company still has other legacy legal issues to sort out, such as landowner lawsuits in Pennsylvania and an ongoing dispute with McClendon, and it really could use higher natural gas prices in order to drive meaningful future returns for investors.